Omsk hemorrhagic fever virus (OHFV) is a tick-borne flavivirus classified as a biosafety level-4 (BSL4) pathogen. Studies of OHFV are restricted to be conducted within BSL4 laboratories. Currently, no commercial vaccines or antiviral drugs are available against OHFV infection. In this study, we recovered a replication-deficient OHFV with an NS1 deletion (OHFV-ΔNS1) and reporter virus replacing NS1 with the Gaussia luciferase (Gluc) (OHFV-ΔNS1-Gluc). Both the defective OHFV-ΔNS1 and OHFV-ΔNS1-Gluc virus could only replicate efficiently in the BHK21 cell line expressing NS1 (BHK21NS1) but not in naïve BHK21 cells. The Gluc reporter gene of OHFV-ΔNS1-Gluc virus was maintained stably after serial passaging of BHK21NS1 cells and was used to surrogate the replication of OHFV. Using NITD008, OHFV-ΔNS1-Gluc virus was validated for antiviral screening, and high-throughput screening parameters were optimized in a 96-well plate format with a calculated Z′ value above 0.5. 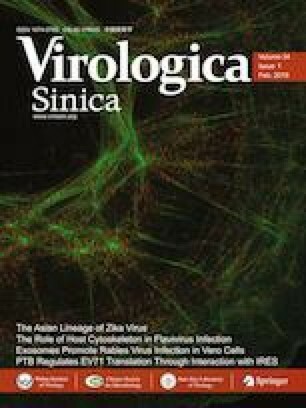 The OHFV-ΔNS1-Gluc reporter virus is a powerful tool for antiviral screening as well as viral replication and pathogenesis studies in BSL2 laboratories. This work was supported by National Science and Technology Major Project on Important Infectious Diseases Prevention and Control (2018ZX10734404-010) and National Key Research and Development Program of China (2018YFA0507201). We thank the Center for Instrumental Analysis and Metrology, Wuhan Institute of Virology, Wuhan National Biosafety Level 4 Lab of CAS and Wuhan Key Laboratory of Special Pathogens and Biosafety for helpful assistance during the course of the work. BZ designed the experiments. QZ, NL, CD, and ZZ carried out the experiments. HY, and BZ analyzed the data. QZ, XL, CD, and BZ wrote the paper. All authors read and approved the final manuscript.